“I’m lousy for branding,” says playwright Walt McGough. He means that his work is not easily categorized. His best-known play, “The Farm,” is a spy drama that includes a visit from a different kind of spook. “Priscilla Dreams the Answer” is a poignant comedy about a reality-TV fan with some space-alien houseguests. In June, the New Repertory Theatre will premiere “Pattern of Life,” which forges a connection between a US drone pilot and a man from the Pakistani village the drone attacked. Hard enough to find the common thread in those works, but now Argos Productions is performing McGough’s “The Haberdasher! 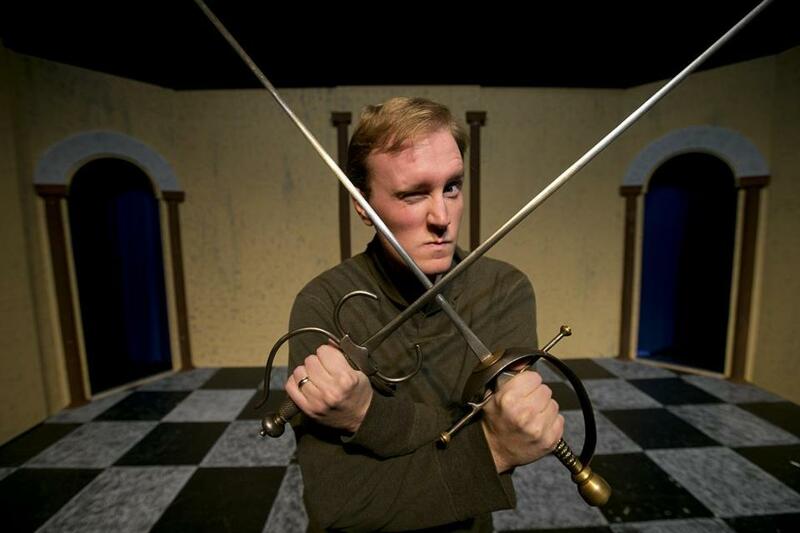 A Tale of Derring-Do” at the Boston Playwrights’ Theatre through Jan. 25. It’s a comic tale of swashbuckling adventure, set in France in “the olde romantic time.” And while it has a point to make by offering female heroes, adults and kids alike will hardly notice amid the almost nonstop action and hilarity. McGough (rhymes with “cough”) likes to challenge his casts, directors, and designers, he says, but beyond that there’s not a lot of thematic consistency in his work. When he was first learning to write, he read two Michael Frayn plays, “Noises Off” and “Copenhagen,” back to back. In “The Haberdasher!,” that’s probably a sword, or a certain important piece of jewelry. Antoinette (Kaitee Tredway), the title character, is apprenticed to the shop owner Bellamy (Mark Estano), who admires her work enough to overlook her gender. But when the charismatic burglar Vivienne (Hannah Husband) enters the shop to pilfer a disguise, Antoinette begins to morph into a hero. At first she’s not comfortable with a sword, but when she picks up her “measuring stick” instead and threatens to check inseams, even the bad guys fall in line. She and Vivienne get on a sort of “Thelma and Louise” mission. Lucas (Brendan Mulhern), the constable, is hot on their trail, or maybe he’s just hot for Vivienne. If the swordfights and intrigues weren’t enough, McGough wrote “The Haberdasher!” with nine additional characters for those four actors to play. As the plot complications mount in the second act, the actors find themselves switching roles faster and faster, until some are actually swordfighting with themselves in a long, delirious comic scene. Not easy stuff to stage, especially on a shoestring budget. Things got even more challenging when the actress originally cast to play Antoinette slipped on ice and broke her elbow, Marks says, making her unable to wield a sword. “Once I stopped crying,” he says, he quickly found Tredway. Despite it being a two-act play with lots of fast changes and lots of swordfights, she stepped onto the stage on opening night ready to swashbuckle, just 10 days after being hired. It is, after all, a play about female heroes. McGough, 29, of Newton, has a day job as an administrative and artistic associate at SpeakEasy Stage Company. But he’s an up-and-comer among Boston playwrights. “If you just look at the landscape of new work here over the past couple of years, Walt’s name pops up quite a bit,” says Bridget Kathleen O’Leary, New Rep’s associate artistic director. He’s one of the 2012-14 playwriting fellows at the Huntington Theatre Company and a 2013-14 Next Voices Fellow at New Rep.
He’s not the only emerging writer in his house, either. Wife Annie Cardi will publish her first young adult novel, “The Chance You Won’t Return,” in April. “Pattern of Life” began as a submission to the National New Play Network, of which New Rep is a member. O’Leary read it, and when the network passed, she got New Rep involved. Now she’ll direct the production as part of its Next Voices Festival, June 7-22 (www.newrep.org). “Walt thought he was just going to meet with me about possibly working with us on developing it, and we just offered him a production outright,” O’Leary says. The idea arose from a magazine article about a US-based drone pilot, McGough says: “He had basically gone through (post-traumatic stress disorder). For a long time the narrative that was given and that I certainly bought was that drones were kind of the easy solution, because they were always accurate and nobody got killed who wasn’t supposed to get killed. And that was sort of a comforting thing.” That the truth wasn’t so simple — that drone attacks are a major recruiting tool for terrorists — made him think the issue was worth discussing on stage. “I was getting a little too much thematic whiplash,” he says.